Result of UPSC CMS 2017 Written Examination Out! 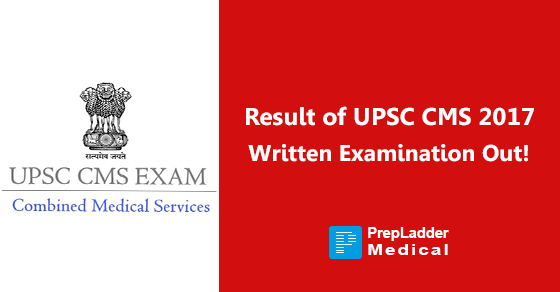 The much awaited result of UPSC CMS written examination 2017 which was held on August 13, 2017 has been announced. On the basis of result of written examination, UPSC has released a list of Roll Numbers who have qualified for personality test/interview. Candidates are further required to fill up the Detailed Application Form (DAF), which will be available on the official website along with other instruction regarding filling up the DAF, from September 14 to 26, 2017 till 6:00 PM. Carefully read the instruction for filling up the DAF and Rules of the Combined Medical Services Examination, 2017 with regard to the certificates that must be produced at the time of Interview. In case candidate fails to bring any or all the required original documents in the interview, he/she will not be permitted to present himself/herself before the PT Board and no TA will be allowed. The candidature of the selected candidates is provisional subject to fulfillment of the eligibility in all respects. Candidates are advised to be ready with the original certificates in support of their claims relating to age, educational qualifications, community, physical disability (where applicable) etc. at the time of the Personality Test. Interview for the candidates who have qualified for the Personality Test is likely to commence in the last week of October, 2017. Moreover, the exact date of interview will be intimated to the candidates through e-Summon Letter and the schedule will be made available on the official website. Thus, candidates are requested to stay updated by visiting the official website. No request will be entertained in any circumstances for change in the date and time of Personality Test intimated to the candidates. The mark-sheet of candidates who have not qualified will be uploaded on the official website after the final result publication (i.e. after conducting Personality Test) which will remain available on the website for a period of 60 days. For more information/clarification regarding the examination/result: Contact between 10.00 A.M. to 5.00 P.M in person or over telephone Nos. (011)-23385271/23381125/23098543.